We should all know the importance of eating breakfast for health and performance reasons. It may now be the most important meal of the day for restaurants as well. We usually use coupons but even without one, we still keep the bill around $20. With the current economy we’re not the only ones eating out early. In the restaurant business the morning meal is driving in traffic. According to Bonnie Riggs, a restaurant analyst, it’s the meal that shows growth first post-recession and is positioned to show the strongest growth for the next decade. Eateries that previously didn’t serve the first meal of the day are jumping in with two feet. Subway tested breakfast in all San Diego stores last year and it was a big success that they subsequently rolled out nationally. Wendy’s and Taco Bell are testing breakfast products in certain markets. Even fine dining establishments are giving in to the demand for breakfast by offering weekend breakfast or brunches. Consumers always win when there is more competition. McDonald’s focused on competing for coffee drinkers (and against Starbucks) when they rolled out their McCafe lattes. Not only do they offer coupons but the base price is lower. Benefit: Lower Prices. In addition to saving money you have more options on where to spend it. Do you want to dine at fast food, casual or fine dining establishment? They say that variety is the spice of life. Benefit: Choice. Now you can start your day off with more options than before including many healthier items. Many restaurant businesses, including fast food, offer lower fat and calorie menu items whether it be yogurt with fruit or egg white/turkey bacon sandwiches. Benefit: Good Health. Do you start your day with a good meal from home or dine out? I have noticed this trend as well. The fact that you can still have the same experience for a fraction of the cost is very intriguing. I’m also noticing that all fast food restaurants in my area (New Jersey) are offering smoothies and slurpies now! Khaleef, good observation about the smoothies. They’re everywhere here as well; even McDonalds. My 81 y/o father-in-law loves them! Breakfast out is cheaper than lunch out, which is cheaper than dinner out. Donna, my husband and I do belong to the IHOP e-club and love their coupons. I eat breakfast out only on weekends when we both can go. My siblings and I lived in Washington growing up (my dad is from Wenatchee). My brother is such a blackberry freak, people always pick him up blackberry hostess pies whenever they head to the Northwest. Evan, I have family members with the same dislike for eating right away. You found a budget-friendly solution. I know several people at my office that have a stash of oatmeal packets as well. 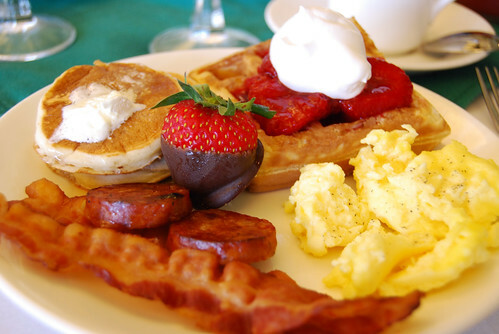 My that picture looks fabulous, I have craving breakfast now and it is 3:00 in the afternoon! I almost always eat breakfast at home. I too am a fan of smoothies, and I make them all the time with my Magic Bullet. On vacation though, I do love to indulge in a breakfast buffet. The Hilton Hotels seem to have the best. Kris, would you recommend the magic bullet? I’ve wondered if it’s an effective blender. I love breakfast buffets as well (as long as they cook eggs to order). I’m not a fan of the wet scrambled eggs.